Home / Entertainment News / SHOCK as man conspires with his MPANGO WA KANDO to kill his wife; they dumped the body along Thika Road. Wednesday, January 30, 2019-A man and his mpango wa kando are in police custody after they conspired to kill his wife and later dumped her body in a dam along Thika Road. 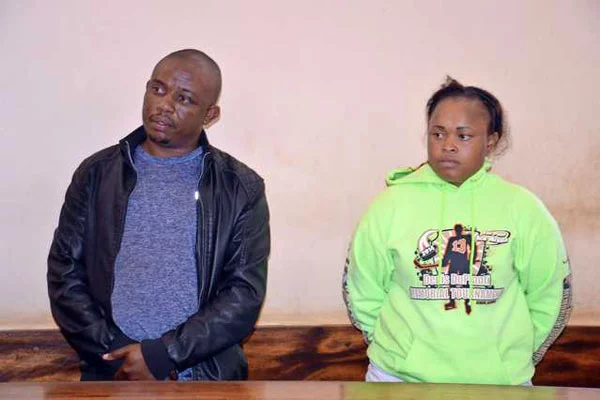 Joseph Kori Karuwe, a 41 year old businessman and Judy Wangui, have been engaged in extra-marital affair, something that Joseph’s wife, Mary Wambui, a businesswoman who ran a very big hardware in Kahawa West, suspected but pretended to act cool. Apparently, Judy happens to be a former employee at Mary’s hardware. Joseph had rented his side-dish Judy a lavish apartment along Kiambu Road where he paid her monthly rent of Ksh 60,000. On the fateful day, Judy hired a taxi and went to her mpango wa kando’s home at Garden Estate to establish his whereabouts. He rang the bell and Mary’s 6 year old son went to open the door. When the boy opened the door, Judy offered to go and buy her pizza at the nearby Thika Road Mall but the young boy went back to the house to seek permission from her mother saying” Auntie Wa Dad” had offered to buy him pizza. When Mary went to see who this “Auntie” is, she came face to face with Judy, the woman who has been sleeping around with her husband. According to reports, they greeted each other and even agreed to go for a lunch date at the nearby Homeland Inn so that they can iron out their differences. Judy then c0nvinced Mary to accompany her to her house at Four Ways Junction along Kiambu Road after a long stay at Homeland Inn and she agreed. When Mary entered Judy’s house, she found her husband in there, confirming her worst fears that he was also the man of the house she visited on that fateful day. On looking at the wall, she saw romantic portraits of her husband and Judy hanged, a clear indication that Judy was sleeping with her husband. It’s reported that a fight ensued and Mary was badly injured and lost her life during the fight. Her body was discovered dumped in a dam in Juja along Thika Road. She had a deep cut on one side of her head and multiple bruises on both hands, indicating she had struggled before her death. Her body was wrapped in bed sheets and put in a sack. Police found blood-stained clothes in Judy’s house and neighbours revealed they had commotion that lasted for long. It’s suspected that Judy and Mary’s husband, Kori, dumped the boy in the dam after killing her. They are both in police custody.